A story of a girl who had a massive crush on a heartthrob high school rock band leader Kyle Hogan. 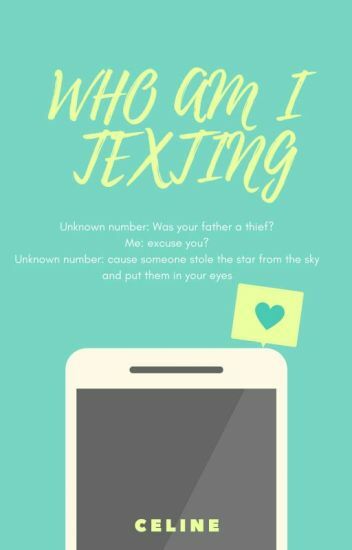 Her life turn upside down when she received a text from an unknown number who admitted to be her secret admirer. Unknown number: Was your father a thief? Unknown: Hey peaches, I'm in love. And you're the lucky winner. Love is beautiful once achieved. But is love as real as it may seem? A/N: I wrote this when I was 12. Have fun with that. No one expects to fall in love when they accidentally send a text to a wrong number. This story is about the journey two strangers embark on as they first become friends and then something more. Could this be love at first text? She dialled the wrong number, he answered. Everyone knew he was a bad news. Yet, I still want him forever even when we're not together. I opened the door to the toilet when he slammed the door shut before I could walk through. "I heard your in some trouble with money," he said. "Was you listening to me in registration?" I questioned. He shrugged. "Since you are in some trouble with money I would be generous and play a simple game. Make me fall in love with you," he whispered into my ears. "What," he spun me around. "You heard me. Make fall in love with you. If you win I'll give you the money you need. If you don't I will reveal your parents little secret and make your life a living hell," he threatened casually walking away. "You've got until the end of July," he called out. Violet is that unusual girl next door. Unnoticeable and hidden behind her glasses. Right now she is in some desperate need for money and she would do anything to get it. Let's see what happens when she is forced to make a deal with the bad boy. Arty can't stand that he has to be in a project with all around quirky girl, Abigail. He hates her, with a passion. Arty knows Abigail is smart, that's why she's in Arty's Advanced Calculus. When they get paired together for a big project, how will Arty react and handle Abigail? Highest ranking #53 in short story! What happens when you mix a lost phone, blue eyes, basketball, and two people who never met but are the best of friends? Find out in Texting Him. "all you need to know is I'm a guy that's your age and goes to your school." "thanks, that narrows it down to about two hundred people."